I mentioned in my inaugural post how I came to realize that an architectural piece that I saw on a trip to Berlin (in 2003), turned out to be an installation by Olafur Eliasson. At the time of my trip, I did not know who Eliasson was, or that what I saw was an art installation. I thought what I saw was an example of a modern element that Germans are so good at adding to everyday architecture, often in unexpected places. While doing research recently for my post on Olafur Eliasson (at the Margulies Collection in Miami) though, I learned that what I saw in Potzdammer Platz was in fact his work. Entitled Windspiegelwand (I think it translates as Wind Wound Mirror), it is a series of mirror plates that line the sides of a building. The mirror plates move freely with the wind, reflecting the sky at different angles. It was very pretty to look at. Above is the photograph that I took at the time. 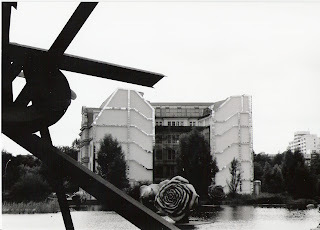 As you can see there were other art pieces there: larger than life rose sculptures that seemed to be floating on the pond and a sculpture on the other side. Are they still there? I don't know. May be my visitors from Berlin can respond? This is a perfect example of what I love about contemporary art: The discovery. What I saw a few years ago turned out to be a piece by an artist that I later came to know and appreciate. The Berlin trip was an eye-opening experience. I borrowed a friend's amateur camera, loaded it with black & white film, and clicked away to capture modern architecture all around town. It is one of my most memorable trips.